It may not have been the best, the biggest, or the most reliable, but we all remember our first boat. 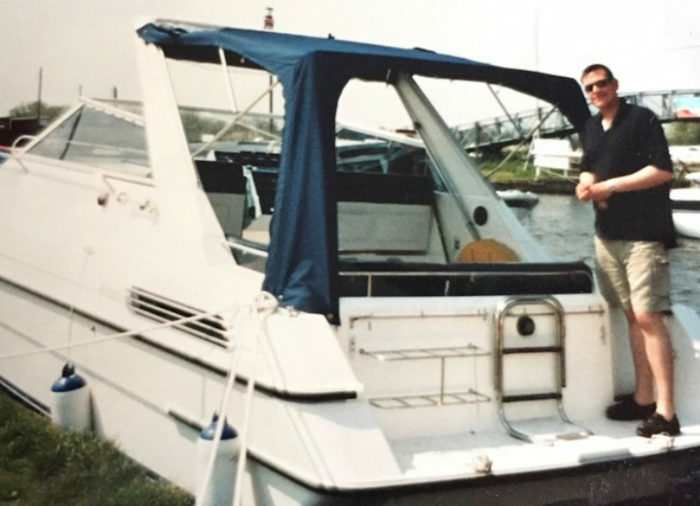 We’d love to hear your early boating memories, so to get the ball rolling we asked NYA managing director James Fraser to tell us about the first boat he owned, way back in the 1980s. What was your first boat? 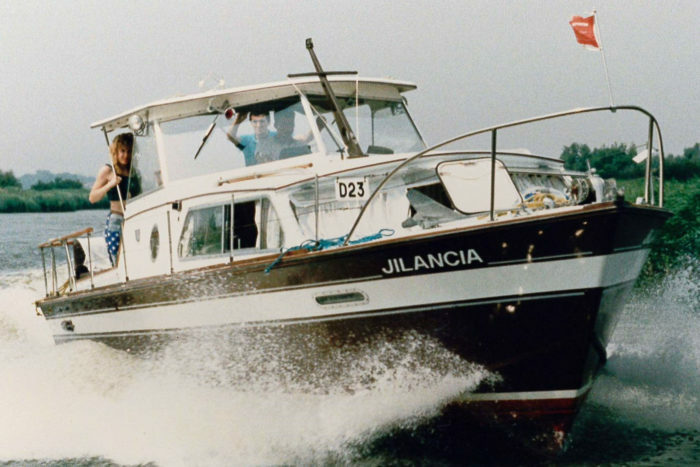 My first boat was a Cleopatra 30 called Jilancia. From memory, she was a 1974 build and I bought her in 1989. 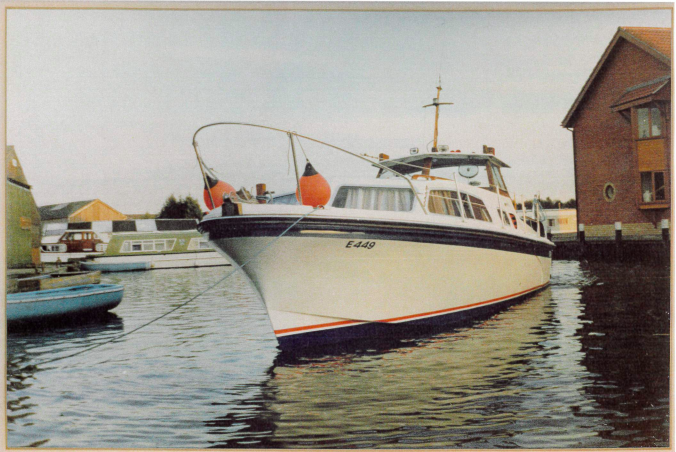 She was lying at Bells Marina in Brundall.She had been very well loved throughout her life but what really appealed was that she had been re-engined a couple of years earlier with brand new OMC V6 petrol engines and drives. She went well. How much did it cost and when did you buy it? She cost me about £12,000, a lot of money for a 19-year-old boat salesman! Good old Barclays lent me the money and I lived on board (in the company sales area in Horning) so saved on rent payments. Favourite memory of the boat? It was a great boat and I had a lot of fun on her in the summer of ’89. I was only 19 and you can see from the picture that I enjoyed myself – those were the days! How and why did you get into boating? I had been boating with my family from the age of six, and boating on the Norfolk Broads from the age of 14. I was then lucky enough to be offered a job by Jim Cole, who owned and ran NYA. How long did you keep it and what did you buy next? I sold her at the end of the summer and rented a holiday house on Ferry Marina to live in for the winter, which was much warmer! The following season I bought a Project 31 called Gaysha. She was powered by twin Volvo 75hp diesels. Much slower, but significantly cheaper to run. What boat do you own now? I now own a Sunseeker Predator 62, which we have had for four years. We have been very impressed with the quality of construction and reliability of this British-built motor cruiser. Give one piece of advice for someone thinking of buying their first boat. My advice to a first-time buyer is not to get too bogged down in other people’s opinions and advice on what you should buy – everyone thinks you should have what they have! Look at lots of different types of boat and make up your own mind. Looking to buy your first boat? Take a look at our advice section, and then browse our boats for sale.